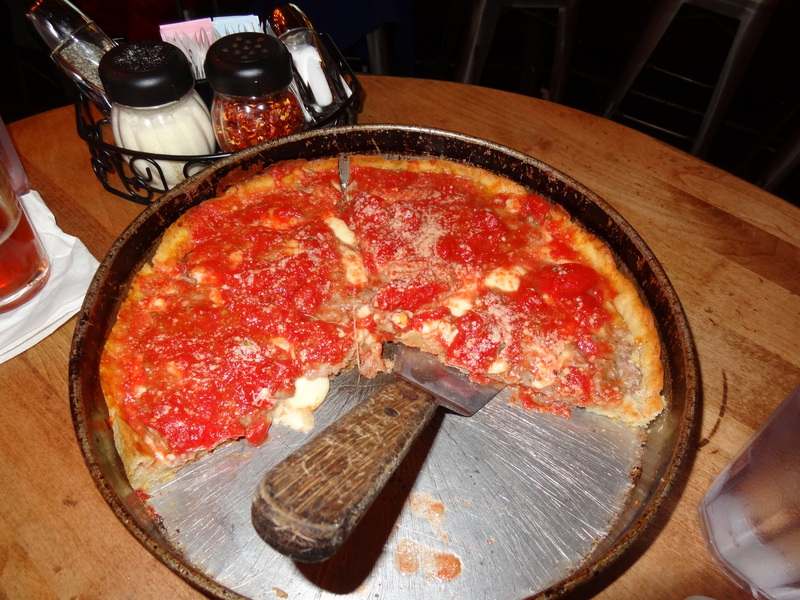 In visiting the Windy City, the plan all along was to stuff my face full of deep dish pizza, and let me tell you, stuff it I did. For the sake of comparison, we had it twice in the four days we were there. 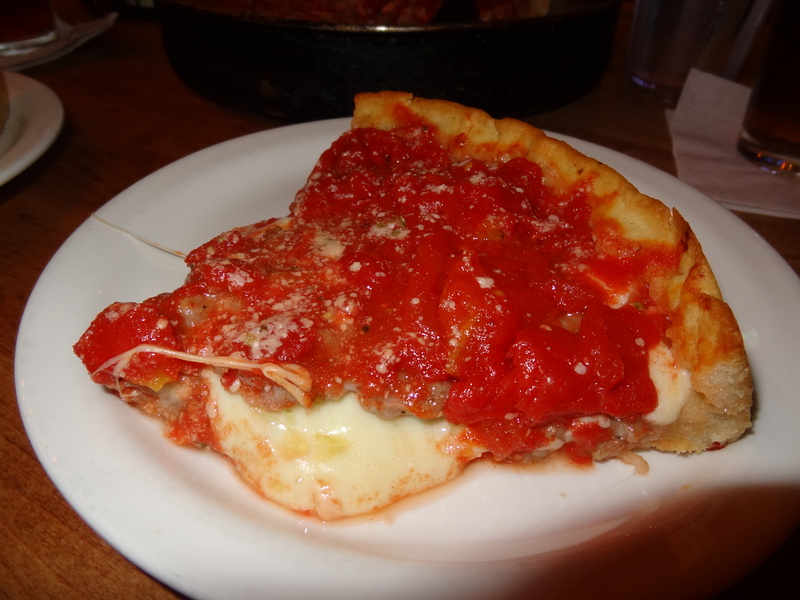 The city has a handful of big names in deep dish pizza, several of which claim to be the original and all of which claim to be the best. Had I been there for about a month, I might have tried them all, but then like I said, I probably would have come back to New York in a coffin, reeking of cheese. Oh you know, just a plain ol’ cheese pizza. the mix, we kept it simple and had a cheese pizza. Not that there was anything simple or minimal about just cheese. As we lifted out the heavy slices of pizza, each at least a couple inches high, thick, gooey globs of creamy mozzarella slowly poured out. It was in-tense. Seriously. So. Much. Cheese. That night, we didn’t have dinner! That’s how intense it was. And those of you that know me, I don’t just skip meals. 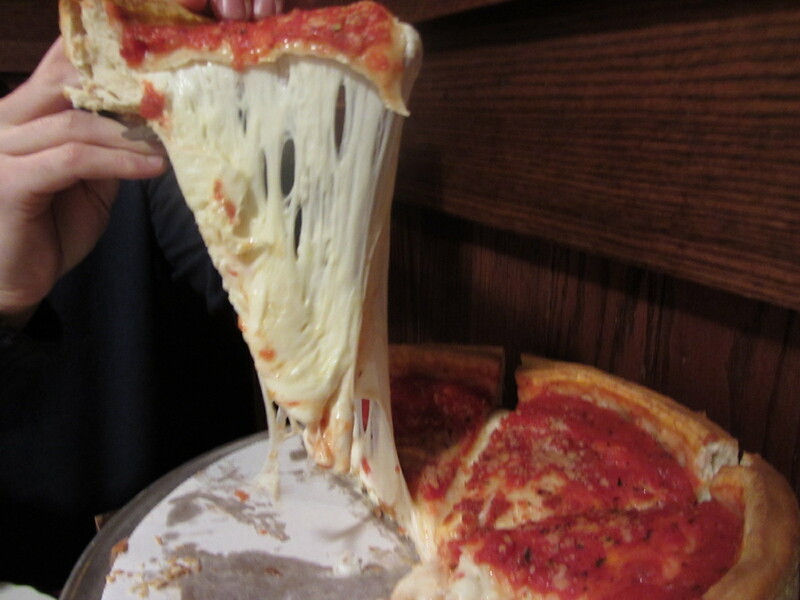 Chicago pizza, you win. I held my own, but long term, I don’t think I could hang. You’re delicious yes, but you’d be the death of me. While having dinner at the too-cool-for-my-own-good Pump Room at the swanky Public Chicago hotel, I came to a realization: I’d love to be one of those travelers that just seems to hang out all day, lounging around the lobby of their plush hotel, requesting 11am wake-up calls and then worrying only about when their in-room massage is scheduled or what time dinner is. Alas, I’m not that kind of traveler. But during an awesome dinner at the Pump Room during my recent jaunt with the beau, I pretended to be, at least for the duration of dinner. The Jean-Georges restaurant seems to have borrowed lots of menu items from another JG restaurant, the always-without-fail delicious ABC Kitchen in New York, which was more than fine by me since that pretty much guaranteed the food would be amazing. And it was. Lessons in deliciousness: coating calamari in pretzel crumbs. 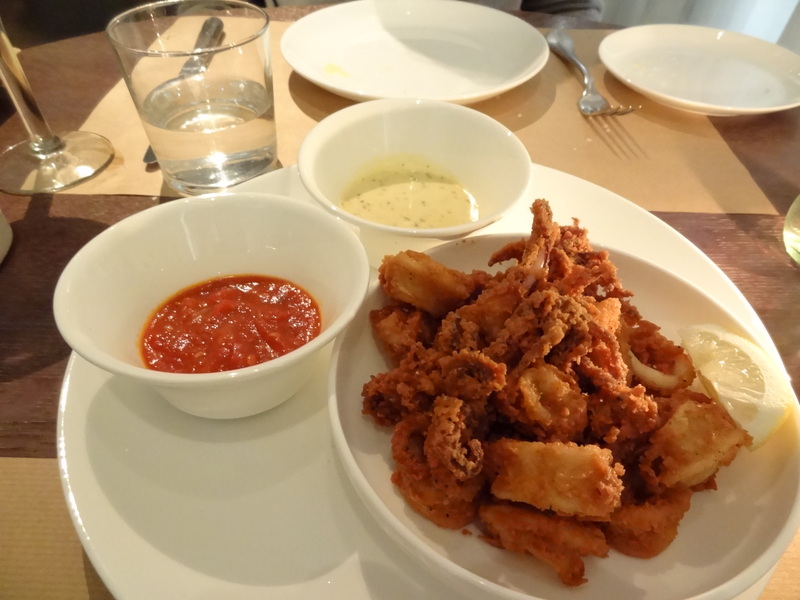 The boy and I started out with an order of pretzel dusted calamari, something I’d already had (and loved) at ABC. With both a tangy, sweet marinara sauce and a creamy, spicy mustard aioli, this was just more of a good thing. Every city in the world should have a place to get this dish. It’s always a good time for flatbread, especially if it involves truffles. 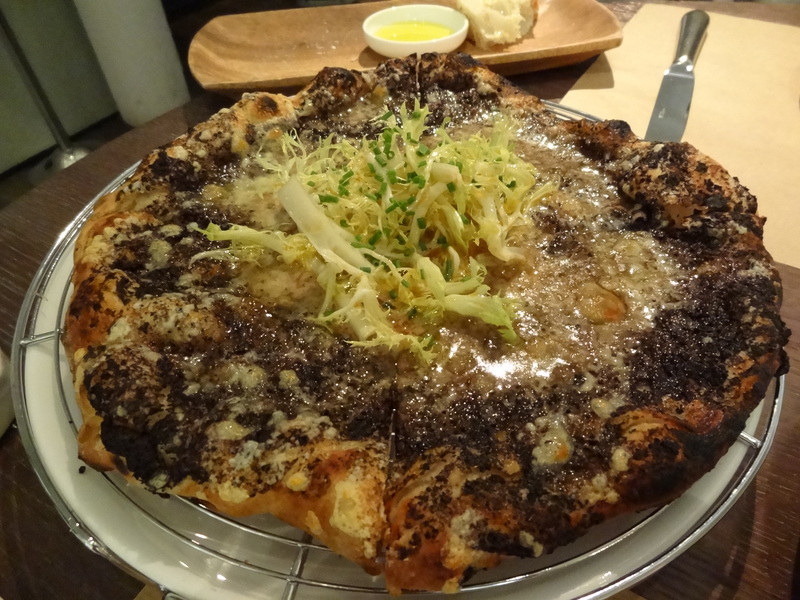 And because I don’t believe in holding back while on vacation, we also got one of Pump Room’s whole wheat flatbreads, the one with black truffle, fontina and frisee salad. It was just the right amount of doughy, cheesy and truffley (yea, I know, not a real word). 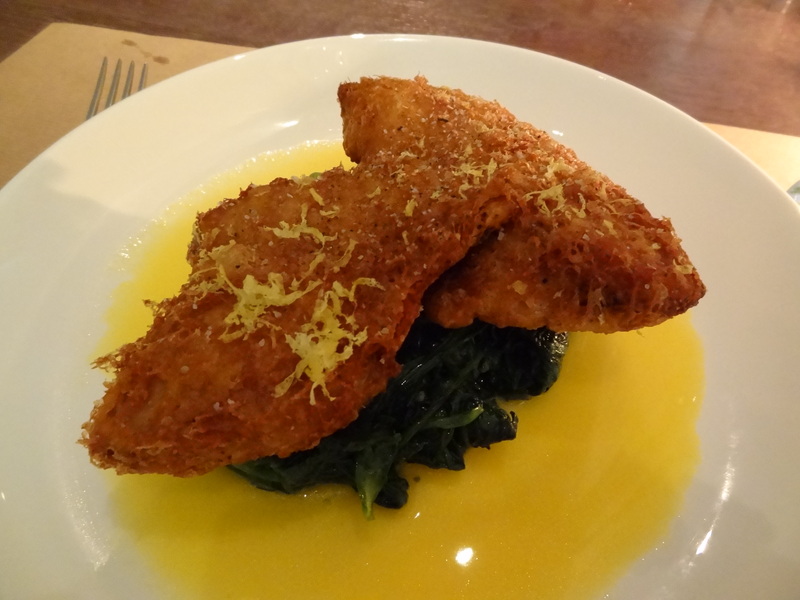 Fried chicken on a bed of spinach, wait for it, in spicy butter. Mind blown, huh? For the entree, I went with fried organic chicken cause really, is there anything harder to resist than good fried chicken? This one came with spinach and a velvety, fiery homemade hot sauce butter. Crunchy skin, tender, juicy meat, and spinach to make you understand Popeye a million times over. Heaven on a dish, no lie, people. Short rib and pureed potatoes. YES please. Flaneur ordered the glazed beef short rib with potato puree and a crunchy, cheddar garnish.The spicy peppers gave a tasty heat to the hearty, delicious meat. I’m never a huge fan of short ribs, but this could make a believer out of anyone. 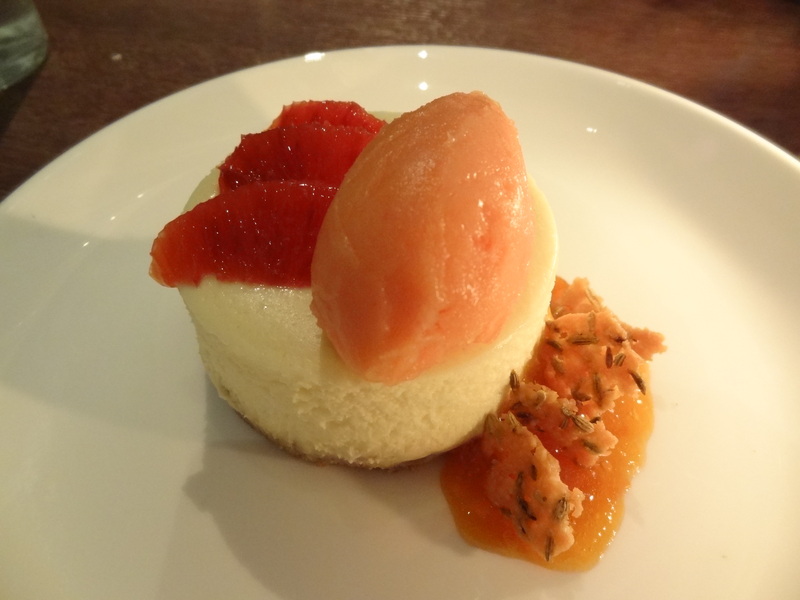 And finally, because I wouldn’t dare leave a restaurant like this without dessert, we split the creme fraiche cheesecake with blood orange sorbet, fennel crisps and kumquat marmalade. With its creamy consistency and fresh, clean fruity flavors, it was a nice, subtle note to end the dinner on. I could have eaten four more though, just for the record. While I might appear slothlike, I’m really not, and especially when I travel, I like to hit the ground running. Even after a taxi-flight-taxi combo, the extra added annoyances of flight delays, last-minute carry-on bags having to be checked, and spending almost 3 hours wedged into the dreaded middle seat, as soon as Flaneur and I got to our hotel in Chicago I wanted to go OUT. There was a restaurant I was itching to go to and the next day just wasn’t soon enough. What if I died in my sleep and never made it? So instead of kicking back and relaxing, off we went in search of The Purple Pig, a restaurant one of my friends in San Francisco raved about and insisted I go to. Next time I see this friend, I owe her a drink at the very least because The Purple Pig was ridiculous–in the best way. Fireworks and a parade wouldn’t have made for a better welcome to the city. 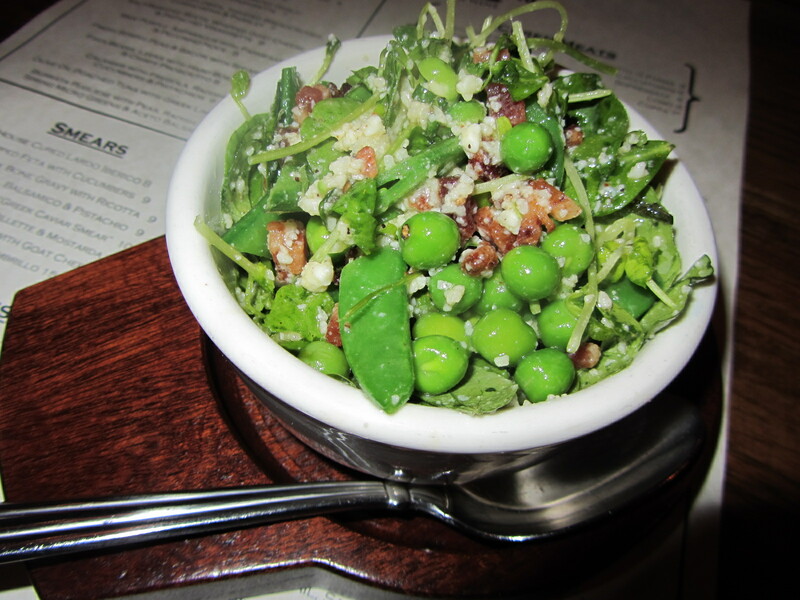 First out, from the antipasti section of the menu, were the fresh spring peas and bacon with spearmint. Fattest, most delicious peas I’ve ever eaten. I could eat this all day, every day. Peas unlike any I’ve ever had. 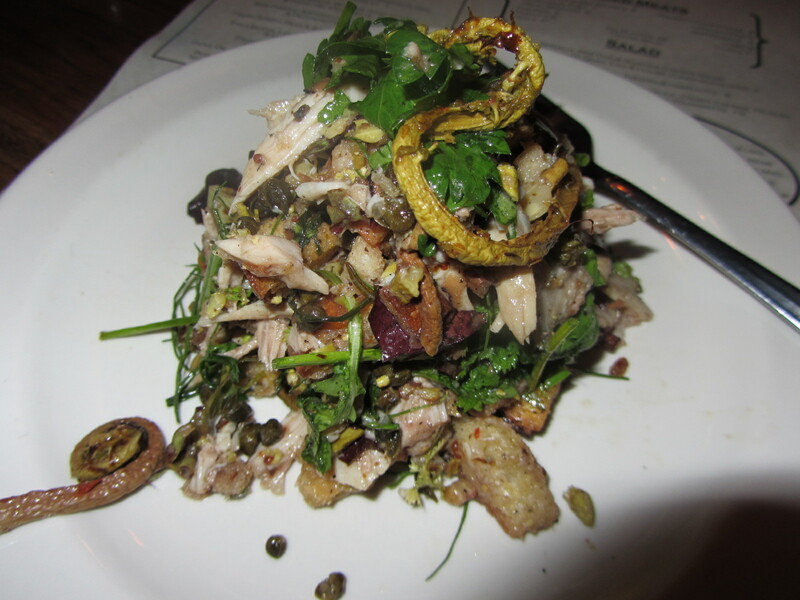 From the salad portion of the menu, rabbit panzanella with mixed herbs and lettuce, crispy capers, pickled fiddlehead ferns (that’s one of the curliecues in the left corner) and black truffle vinaigrette. Panzanella, a type of italian bread salad, is one of my favorite easy dishes but this took it to a whole new level. So many colors, flavors, textures. So. Much. Deliciousness. A crazy heap of panzanella. Crazy good, that is. 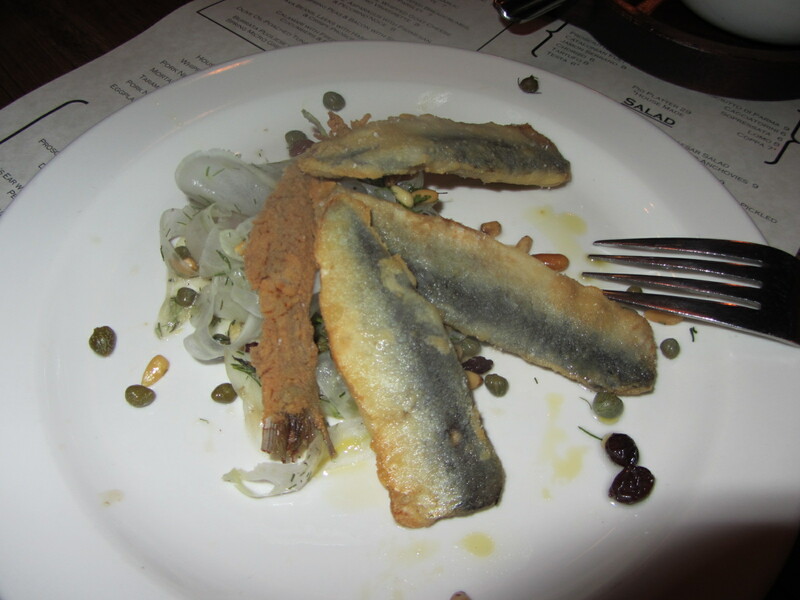 Then from the fried items: sardines with shaved fennel salad and lemon vinaigrette. This is one of those dishes that makes you wish you were on vacation at the beach somewhere, maybe in Italy. But then when you realize you’re not, you’re still ok because you have these damn tasty sardines in front of you, and that’s more than enough. Fried sardines: salty, tangy and just perfect. 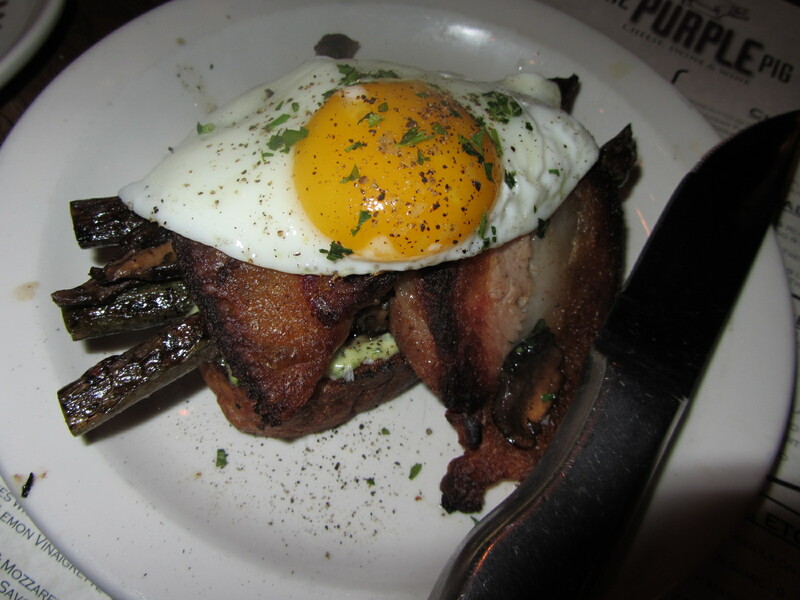 Next, from the a la plancha part: pork jowl and grilled asparagus with oyster mushrooms and fried duck egg on top. This was probably, no definitely, my favorite. 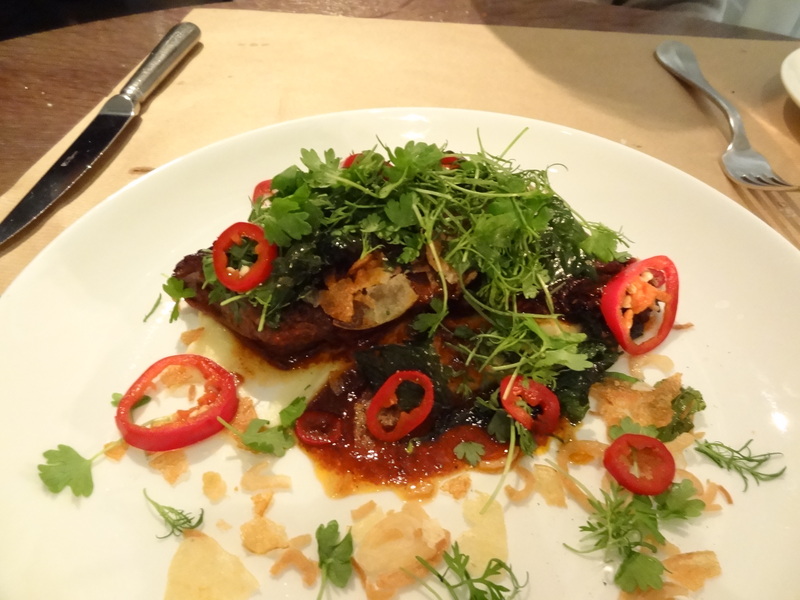 The pork jowl was tender and meaty, and when that perfect, orange duck yolk spilled over it? I could have cried if I wasn’t busy stuffing forkfuls in my mouth. Pork jowl and fried duck egg. The people sitting next to us were blatantly staring at us while we ate this, food envy written all over their faces. Last in our succession of savory eats, the pork neck bone gravy with ricotta from the smears section of the menu. 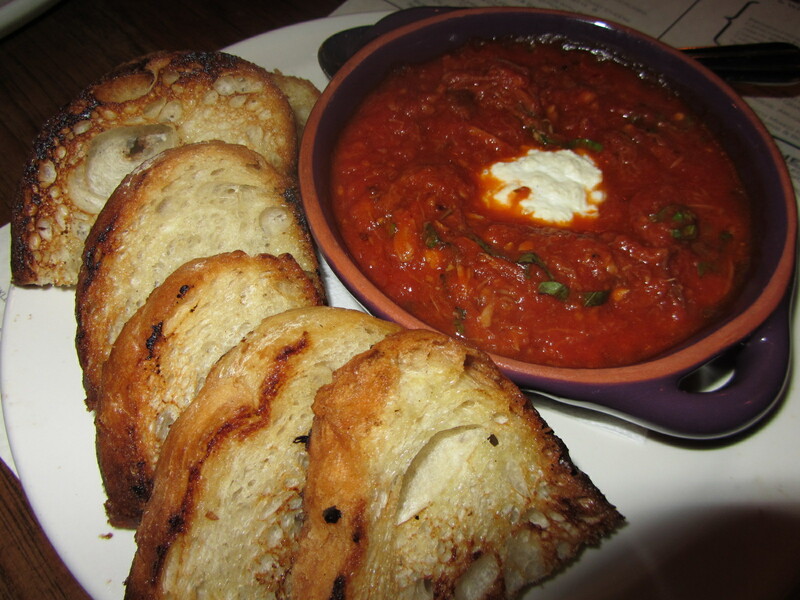 A hearty, saucy, rich dish served with crunchy toast for smearing and dipping, this was a great example of what i consider comfort food. Pork neck gravy and ricotta smear. As in, I want to smear this all over my mouth. And then finally, dessert. 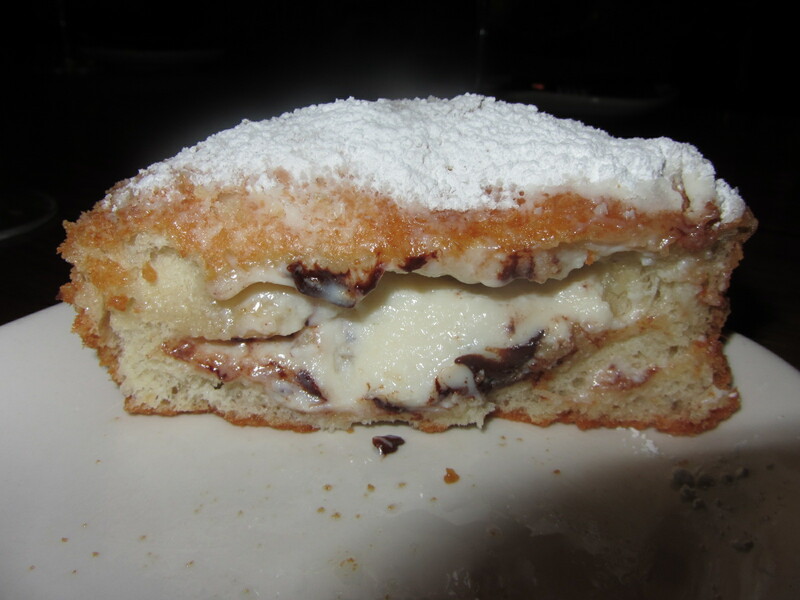 It wasn’t easy choosing but at the server’s recommendation, we went with the Sicilian Iris, a ricotta and chocolate chip filled fried brioche. Sounds magnificent doesn’t it? Oh, and it WAS. Something like a cross between a canolo and a bombolone, this thing was unreal. When it came it out, it looked like a round, fat, sugar-dusted donut but inside, it oozed, warm creamy ricotta with dark chocolate chips. Totally decadent, and so, so, so very good. Not only was this one of my favorite meals in Chicago, but one of my favorite ever. I’d go back to Chicago just to eat at The Purple Pig again. This might just be me, but it seems like every time I take a vacation, be it a weekend jaunt or a longer trip farther away, I immediately feel like I need another vacation just to recoup from the first one. After last week’s long weekend in Chicago, where I went with the beau for three days of being a tourist and one of being a wedding guest, I not only need another vacation but a serious detox, juice cleanse, boot camp and possibly a jaw-wiring procedure, too. I had never been to Chicago and so felt the need to eat my way through the city like someone on death row at his last meal— except for four consecutive days. (Not counting the gorging we did on the first night we landed, more on that later.) I’ll keep telling myself that the miles and miles we walked around the city countered our obscene caloric intake, but really, deep inside, past the thick layers of adipose tissue, I know better. Behold, the Chicago style hot dog. A whole lotta tastiness right there. 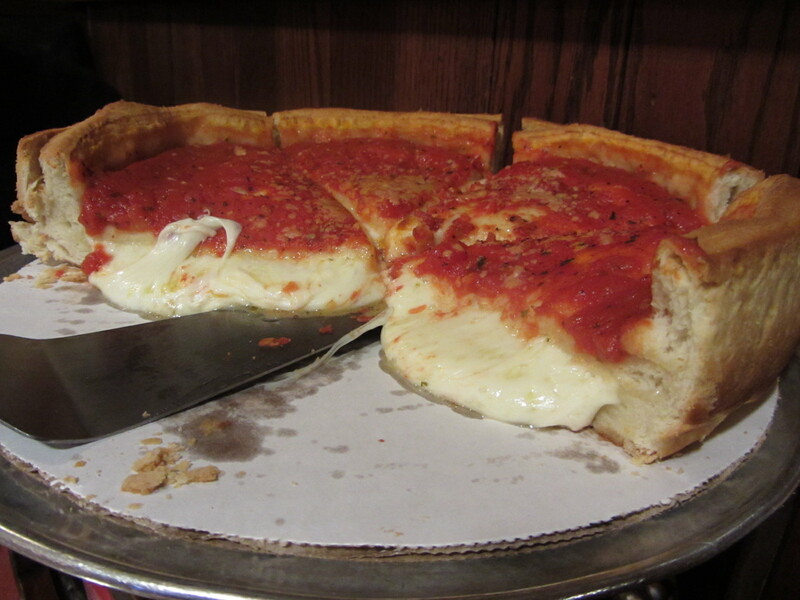 All talk of my morbid obesity aside, Chicago was a great city that I thoroughly enjoyed and would happily visit again. We had lots of good food, ranging from quick bites at holes-in-the-wall to fancy meals at trendy restaurants, and several others in between. 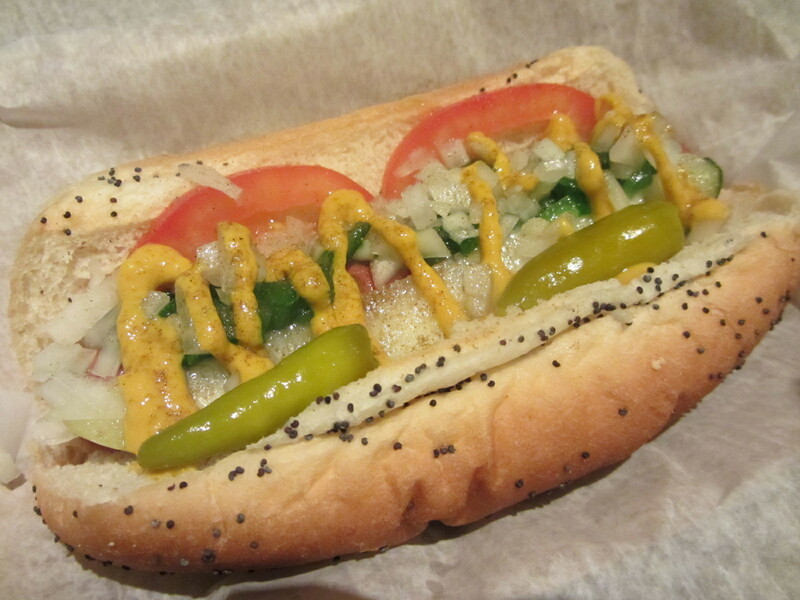 In the end though, one of my favorites was a Chicago food icon, the famed Chicago style hot dog. While I think New York is a better city than Chicago, they definitely have us beat in the hot dog department, hands down.